An abstract prepared for the Criminal Law Library Blog by Michael Chernicoff. As I am sure you know this year is on track to produce a budget disaster for libraries in New York City. The cuts currently proposed will result in massive layoffs and cuts in public service. A small group of library workers and concerned citizens has started a postcard campaign to highlight support for public libraries and ask the City Council to restore as much funding to library budgets as possible. The idea is that we are going back to an old fashioned postcard writing campaign. 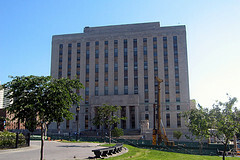 Individuals are encouraged to write postcards in support of libraries and mail them to the offices of City Council Member Jimmy Van Bramer. His office will collect the postcards and present them to the City Council, en masse as a sort of Miracle on 34th Street statement. Any postcards will do. We suggest being creative, but inexpensive postcards, ten for a dollar in Time Square, work great too. A giant of New York politics and law enforcement recently retired from public office– Robert Morgenthau. Scion to a powerful family, Robert Morgenthau’s grandfather served as United States Ambassador to the Ottoman Empire, and his father was Secretary of the Treasury under Franklin Delano Roosevelt. While his famous name and lineage may have helped to open doors, Robert Morgenthau was determined to find a profession where he could navigate his own path in life. After honorable combat service in the navy during World War 2, where his ship was torpedoed, Robert Morgenthau proceeded to law school and rose to partner in a major law firm. However, Robert Morgenthau largely dedicated his professional career, and indeed his life, to public service. 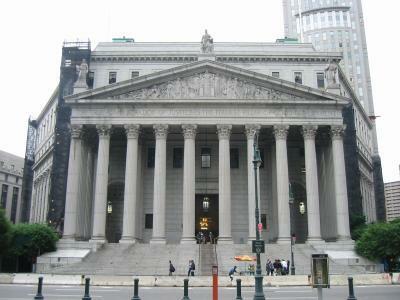 He served as United States Attorney for the Southern District of New York for an eight year period from 1961 -1969. But he will surely best be remembered for his longstanding and legendary tenure as New York County District Attorney that spanned a thirty-five year period from 1974 – 2009. In this latter capacity, he resuscitated the office which was ravaged by budget problems and made it, what many law enforcement officials consider, the finest district attorney’s office in the nation and possibly the best overall law enforcement office in the nation. The following is from a letter sent by New York City Mayor Michael Bloomberg to OMB Director Peter Orszag requesting full federal funding to reimburse the City for security costs associated with Terrorism Trials to be held in Manhattan. 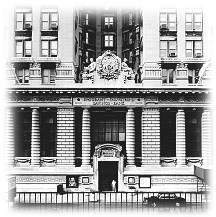 One hundred years ago last Tuesday (November 3, 1909) the criminal court building in Manhattan (bounded by Centre, Lafayette, Franklin, and White Streets) was declared unsafe for human occupancy and everyone in the building at the time was ordered to leave immediately. 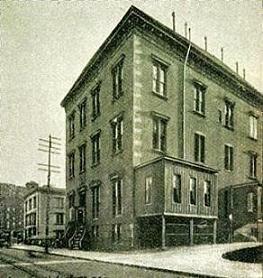 According to a New York Times article Written the following day, “when the last man was out a squad of thirty policemen under Inspector Daley and Captain Galvin took charge of the building, roping it off on all sides and remaining on guard outside the building to forbid anyone to enter or even pass through any of the flanking streets”. 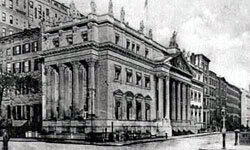 The library was first known as the New York Law Library, and justices of the Supreme Court of the First Judicial District were its trustees. 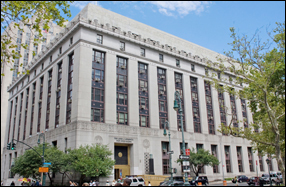 The law library was first located at 32 Chambers Street. 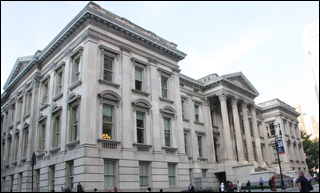 This building is variously known as the Court of General Sessions, Marine Court and City Court. (3) The architect may have been John McComb,Jr. 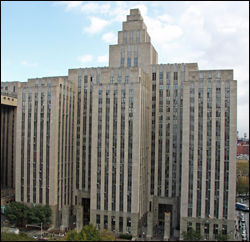 who designed the new City Hall and other buildings in the area.